It’s no secret that I am pretty much THE Thierry Mugler Fan Boy and there’s nothing that I enjoy more than a trip to Planet Mugler, but would you believe there was a time, many Mugler moons ago, when I really didn’t like the Thierry Mugler perfumes? I don’t think I have ever been more appalled by two perfumes in my entire life than when I tried both Angel and A*Men for the very first time. To call them an ‘assault on the senses’ would be a dramatic understatement. But as you know, tastes change and I kept coming back to them. There was just something alluring about this ‘assault’ that I couldn’t quite put my finger on, and it wasn’t long before I ended up buying my first bottles of Angel and A*men. That’s when my Muglerian-obsession started. 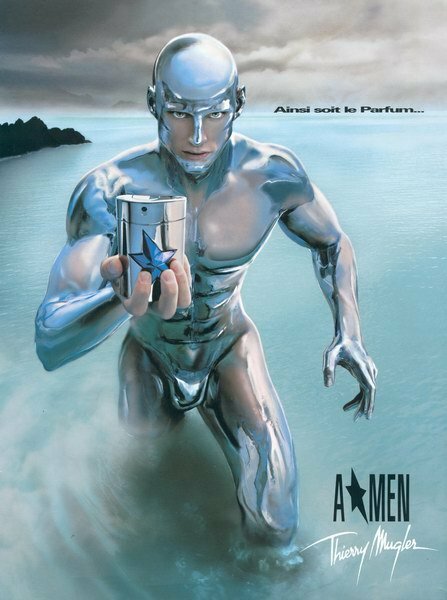 A*Men, or Angel Men as it is often referred to, was Thierry Mugler’s first, and currently the brand’s only, masculine fragrance. Released in 1996, it was created to be a masculine interpretation of the already-quite-masculine Angel, released four years previously. With A*Men, Mugler was inspired by the comic book superheroes of his childhood, and in particular his favourite hero ‘The Silver Surfer’. Since its release A*Men has become somewhat of a cult fragrance, and has spawned a number of pretty decent flankers including; A*Men Pure Coffee, A*Men Pure Malt, A*Men Pure Havane, A*Men Le Goüt du Parfum and A*Men Pure Shot (to be reviewed tomorrow). Does A*Men deserve cult status? Absolutely! There is nothing else quite like it around, and love it or hate it, you cannot deny just how innovative and unique it is. Looking at the above list of notes you could be forgiven for thinking; “Lavender? Peppermint? Coffee? Vanilla? Chocolate? Patchouli? TAR? How the heck does that all fit together? !” But remember, this is Thierry Mugler we are talking about, it may be unusual, it may even be slightly terrifying, but ultimately, you know that it’s going to work. A*Men opens with a cacophony of ingredients, it is loud and proud to say the least. The first thing I pick out is the bergamot, the most bright and sparkling of citrus fruits that adds a real element of effervescence over A*Men’s deep, rich heart and base. Next to the bergamot lies the distinct aromas of lavender and peppermint, both of which share a herbal, almost camphorous facet that plays nicely with the bergamot. As the deep and rich notes come through it becomes very clear that A*Men is a pure gourmand. Like Angel, A*Men’s central accord is based around the pairing of foody notes such as chocolate, caramel and vanilla with a great big stonking dose of patchouli. The patchouli, along with the burned rubber notes of the tar, acts as a strong contrast to the huge load of sweetness that emanates from the foody notes as well as adding a slight earthiness and amping up those camphorous aspects of the mint and lavender. It is very difficult to describe just how good this contrast is! The only downside to A*Men and its juxtaposition of sugar and patchouli is that it is an undeniably heavy fragrance. When sprayed liberally it’s quite easy to asphyxiate underneath A*Men’s colossal sillage, but when used sparingly (and I’m talking one or two sprays here) it really is heavenly, and it lasts, and lasts, and lasts! Another thing that A*Men shares with Angel is an amazing dry down. Once the patchouli and tar has dried down to nothing more than a mere hint of their former glory, you are left with a wonderfully creamy, sweet base of vanilla, chocolate and caramel, it is simply delicious and is by far my favourite part of A*Men. At this point you start to smell almost good enough to eat. Almost. A*Men is a dramatic, showy fragrance that is the perfect counterpart to the ‘Olfactory-Drag-Queen’ that is Angel. It also perfectly epitomises all that is Mugler and for that reason it may not be the first fragrance you would pick out for those more serious of occasions, but for everything else it is simply perfect and I would go as far as saying that it is one of the greatest masculine fragrances of modern times. 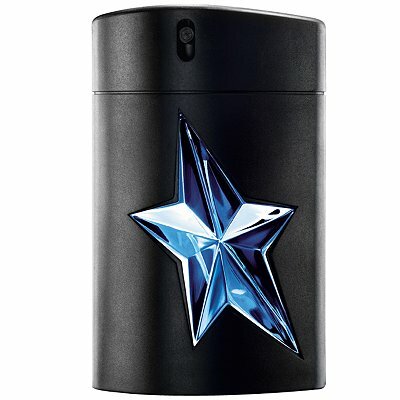 Just like its sister perfume Angel, both of A*Men’s flacons are centred around Mugler’s signature blue star. This time however, the theme is very much more masculine and less theatrical. A*Men is available in two bottles – a refillable, silver metal flask and a black rubber flask. The metal flask is refillable and feels like a more luxe version of the rubber flask, which is ideal for carrying in your bag. 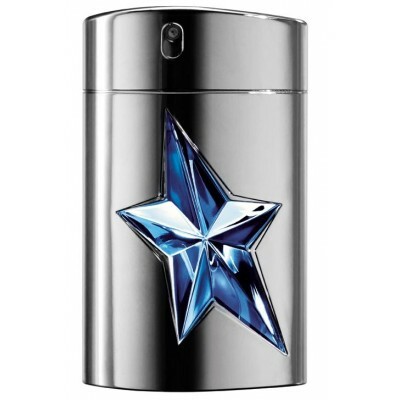 Mugler really excels when it comes to bottle design and the A*Men bottle is no exception. The bottle sits comfortably in your hand and its ergonomic design seems perfectly suited for the active man. For A*Men’s flankers the bottle and star have been dressed in various shades and colours, from bottles of deep brown to stark white and with golden to hot red stars. A*Men is available in 50ml (Rubber Flask) and 100ml (Refillable Metal Flask) Eau de Toilette. Prices range from £35-£64. Matching body products, including Aftershave, Body Shampoo and Spray or Stick Deodorants are also available. This review is based on a sample of A*Men provided by Thierry Mugler. Posted in Masculine, Oriental, Perfume Reviews, Thierry Mugler and tagged A*Men, Angel, Angel Men, Gourmand, Masculine, Thierry Mugler. Bookmark the permalink. I don’t like Mugler and strongly doubt I ever will (some things just don’t change), but I sure love your reviews! You make Mugler’s perfumes come to life, and while I usually get stuck at the notes list and the adjective “terrifying” your wonderfully written reviews keep me interested and keep me reading. And I absolutely adore that ad! What I admire about Mugler is that he is consistent, his universe is coherent in itself. He seems not to pay too much heed to marketing trends and how something sells (and thereby proves that you create legends not by catering to the lowest common denominator), he is innovative and outrageous and that is very refreshing to see in this industry, even if his creations are not for me. Thanks B :D! I do love writing about Mugler perfumes, precisely for those reasons that you have mentioned. I’m a major Mugler fangirl. I’m particularly enjoying Alien Liqueur de Parfum now. Both of my sons love A*Men and have a traveling bottle- they don’t wear it much (I remember when my then-5-year-old blasted himself with the stuff in a department store, he was in a state of bliss, we were not- took a week for the scent to fade! ), but love to smell it now and then. Mugler’s perfumes are utterly original, and I couldn’t live without Mugler Cologne…. Alien Liqueur de Parfum is fab! I can imagine that you suffered a bit during the week when your son blasted himself with A*Men. He had anosmia from respiratory infections, and the A*men cut through that, so of course we was blissed out, he could SMELL! So I say, Bless Thierry Mugler! Bless him! Thierry Mugler perfumes must be the cure for anosmia! Mugler perfumes scare me a bit because they seem so futuristic and cold but that’s just an irrational impression. I don’t think Angel is a cold perfume and I had no idea A*Men was it’s male counterpart. I’m learning lots from you! That note list is crazy and you have to admire Mugler perfumes for doing something original. I will give this a spray when I get a chance, if only to see how all those notes come together! Do let me know what you think of it if you do give it a try. It’s qute something…. I have never smelt A*Men but the drydown sounds rather scrummy. Maybe you should spray it on in the morning and I could jump on one of those slow, cheapo London Midland trains and by the time I arrived in Candy Perfume Boyville the A*Men would have worn off to its optimum phase. Haha that’s a very good idea, and it would have definitely mellowed by the time you arrived! I think Angel is brilliant; A*Men is astonishingly ballsy, and absolutely love Cologne. The A*Men flankers for the most part have been brilliant. I couldn’t agree more, they’re all great! I adore A*Men. It took the terror I felt every time I attempted to wear Angel and tweaked it over the line into ecstasy. For me, the surprise lay in the fact that this adjustment of perception was so casual and slight that I began to question whether my own preconceptions or assumptions about both scent and what could aesthetically be termed “beautiful” were responsible for what I perceived as the difference between heaven (A*Men) and hell (Angel). They’re not that different. What is it inside ME that declares the difference? I still haven’t fully come to terms with Angel yet. But A*Men is slowly facilitating a treaty. That is really fascinating Meg! I wonder what it is in Angel that you don’t like! This is one I reach for on my days off. It is too much of a sillage monster to attempt at work, but then, most of the femme Muglers are as well – the only one I’ve been able to skirt away with is last summer’s Alien in the lavender-to-gold bottle, and that “works for work” in small doses. Speaking of which… Oh how I wish that Team Mugler would make a masculine counterpart to Alien. They could pull it off, and pull it off brilliantly…..
Mugler = sillage monster, even the freshness of Womanity has nuclear sillage! I’m so with you on Alien Pour Homme, it would be fantastic and I’ve never understood why they haven’t done it yet. Perhaps it’s because B*Men and Ice*Men didn’t do too well? There has never been a greater Mugler. I love Angel to death and all, but nothing can ever top A*Men for me. A man – or woman! – in A*Men is just too much for me to handle. Instant swoon! The only problem is that it takes multiple washes to get it out of my clothing! Haha! Oh yeah, the stuff is like nuclear fallout, it lasts forever.